Easy actually - just make the turret's base geometry a tiny cube that won't get seen, and make the ball of the turret the arm. If the centre of the arm is in the centre of the sphere, and the centre of the cube is in the same spot, and this spot is in line with the hull, the turret will rotate like a ball. 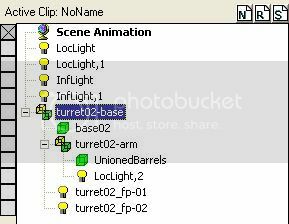 As for unioning the turret barrels - it's not absolutely nessecary, you're right. PCS will merge them into one geometry on conversion if it finds two geometries in the same subobject on the same heirarchy level. However, I've experienced first hand that doing it this way can cause Z buffer problems if any sort of transparency is used, thus it's much safer to union them, though not imperative. Certainly not a reason to reconvert something if that's the only thing 'wrong' with it. It wouldn't happen to look like something like this would it? This will create a single part turret when converted, which is obviously not what you want. To do that, make the Turret01-arm Object Group first - take the ArmGeometry and glue a light to it as a sibling. Then in the heirarchy editor rename the group (not the light or the ArmGeometry - the parent group you just created) to Turret01-arm. To attach your new turret to the hull of your ship, staying in the heirarchy editor, simply select the highest level of heirarchy of your turret (in this case the Turret01-base Object Group), and drag it over your main hull Object Group or geometry - just as you did with the Turret01-arm Object Group. This will glue your new turret to the hull as a child object, which is as it should be. If you're still having trouble, say so and I'll whack some demonstration pics together if you like. Edit: Oops, missed this bit sorry: "opened the turret agin...My light's and axsi are GONE"
If you're still having that problem, it means your axes are off - you need to define the axis for the Turret01-base Object Group as well as for the Turret01-arm Object Group - the axes you define for the individual base and arm geometries are not used. Only those for the Object Groups. I appreciate the help you've given! No worries - once you get the gist of object groups, geometries, heirarchy, lights and axes, it should all become much easier. You should be a good part of the way there already actually. Incidentally - a good way to understand heirarchy is to think of it like an arm. Your arm is the highest level of heirarchy, your palm a child object of it, and your fingers children of the palm. Thus when you move your arm, you move your palm and fingers. When you move your palm, you move your fingers, and your fingers can still move on their own. Oh, and finally, see if there's any way you can 'acquire' a better version of TS, since 3.2 is mind numbing to use and has more bugs than Battlefield 2. Hmm, could you PM/post your pof so I can take a look? I have an idea of what may be happening, but I can't say for certain. A pof would greatly help in this regard. Sure, keep in mind this turret is onl one of many diff attempts I keep overwriting each time so there is only this one. Ah, ok - I can see what's happening here. You've basically got the roles of the turret base and the turret arm reversed. 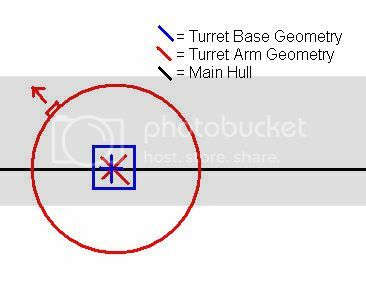 What you would have been seeing in-mission is FS trying to 'aim' the turret base as though it was the barrel, because as far as FS is concerned, it is. You're basically trying to create a single part rotating turret as opposed to a multi-part one. Obviously, you want it to spin on the spot - just like the base of a multi part turret, but you don't want any barrels aiming at things. The way to achieve this is basically to make the barrels invisible. Just take that current hidden cube you have (which is acting as the base), and place it as close to where you want the actual firepoints as possible without it peaking through the hull. Then you glue it to a light to create the "Turret01-arm" Object Group, and you glue that as a child to the base geometry, thus creating the "Turret01-base" Object Group. What will happen is that as far as FS is concerned, it's a perfectly normal multipart turret, but to the player, only the base will rotate - there will be no apparent turret arms. If you then set the actual firepoint to shoot straight out of the centre of the cube (the turret arms), then those shots should emerge very close to the textured-on firepoints. Written in both parts of the turret's subsystem properties. It should only appear in the base's properties, with the arms properties left blank. thanks! I was gonna try teh invisible thingy (liek I do for Trek) a little later, just wanted to get it workign first. As fro teh double table.. seems liek teh mods I opened had that so I was merely going by what I saw. Is that part of the reason it won't fire UNLESS I reverse the roles (as yo u poiunted out) as doing it normal (liek I tried first) won't work at the moment.